And the price decline continued into Q1, says Gavin R. Putland. In March 2012, according to ABS 5609.0, Table 1, series A2412509W, the total value of home lending excluding refinancing was $9.096 billion — the lowest since November 2008. But that had little effect on the following graph, in which the blue curve shows the seasonally-adjusted value of lending for “owner occupation (secured finance) - purchase of other established dwellings”, aggregated quarterly and scaled to GDP. The purple curve shows seasonally-adjusted lending for “investment housing - purchase for rent or resale by individuals”, similarly aggregated and scaled. Both scaled measures remain below their minima of Q3, 2008. Meanwhile the Eight Capital Cities house-price index,* scaled to the CPI (black) or to per-capital GDP (red), continued its decline into the March quarter. Per-capital-GDP (current prices, seasonally adjusted): ABS 5206.0 Table 1. Yellow: “Headline” GDP — chain volume, seasonally adjusted, % change (ABS 5206.0 Table 1). 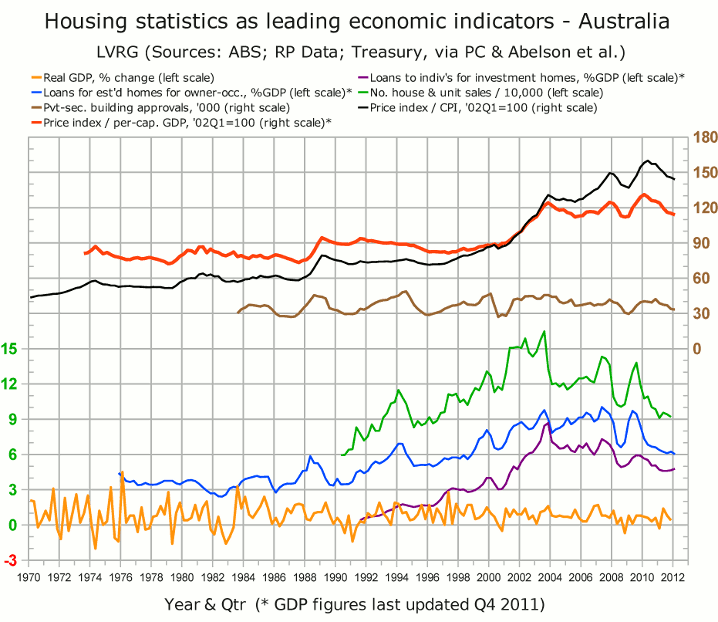 Oz economy contracted in Q1?